Do you know that there are 2.6 billion people who have no access to clean and sanitary toilet? Today is World Toilet Day. It is celebrated in 19 countries with more than 51 events related to water and sanitation. Do you know that there is WTO (not the World Trade Organization) but the World Toilet Organization. The WTO organized the World Toilet Day to create awareness among the rest of the population on the struggle of some 2.6 billion who don’t have access to clean and sanitary toilet facilities. There’s also the WTC (not the World Trade Center) but the World Toilet College that has been conducting courses related to the best practices and standards in toilet design, cleanliness and sanitation technologies since 2005. 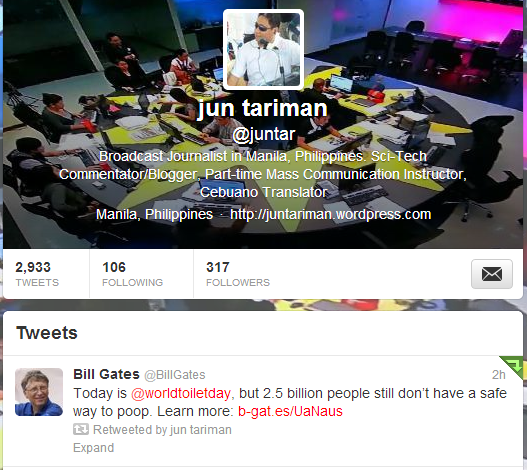 I retweeted Bill Gates’ tweet on the World Toilet Day. WTO record: an average person uses a toilet 2,500 times year, or six to eight times daily. But not all toilet uses flush. As i typed the text here, there are more than 8 billion toilet flushes. Check here the latest toilet flush count. This year’s World Toilet Summit shall be held in Africa. Do you know that “a gram of human feces contains 10 million viruses, one million bacteria, 1,000 parasites, and 100 parasite eggs”, according to this “Toilet Trouble” iReport of the Philippine Center for Investigative Journalism. If you want to know some reviews about public toilet in the Philippines, check The Philippines Public Toilet Chronicle which has some snippets on what to expect in some public toilets. The 2010 Annual Poverty Indicators Survey by the National Statistics Office says one out of four Filipino families belonging to the bottom 30 percent income stratum did not have sanitary toilets at their homes. The United Nations claims that about 26 million Filipinos don’t have access to sanitary toilets until today. When cleaning the toilet, here are some tips from a rappler story. 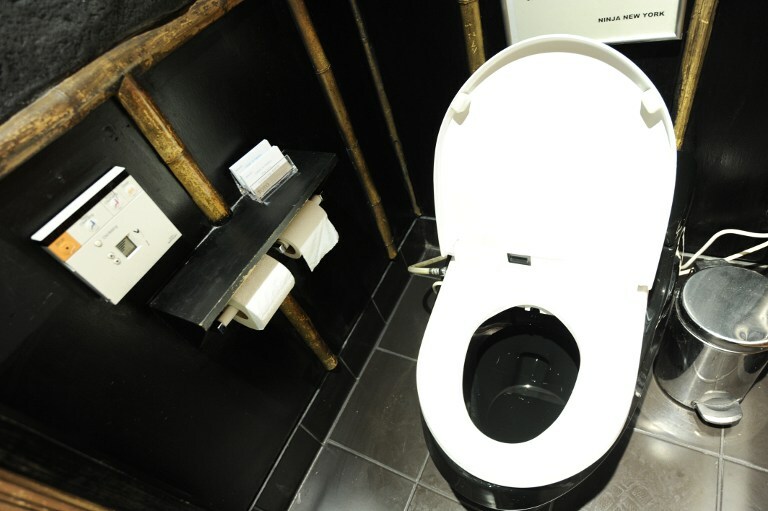 In Japan, more than two-thirds of the households have a Washlets— a high-tech toilet bowl made by Toto. The Washlets has a computerized control panel with pictograms, include water jets with pressure and temperature controls, hot-air bottom dryers and ambient background music. 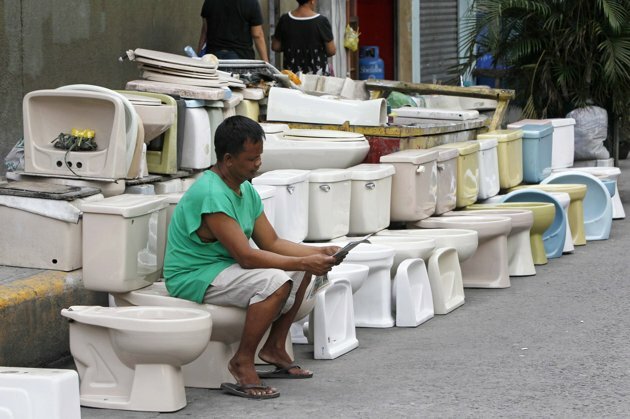 Meanwhile in the Philippines, second hand toilet bowls are up for sale along a street in Paco, Metro Manila.